The Helitran® has been designed for high performance, with advanced features not normally found in traditional liquid helium flow cryostats. A detailed description of the matrix heat exchanger, the adjustable impedance valve and the coaxial transfer line is presented in this tech note. Conventional helium flow cryostats do not incorporate extended surface heat exchangers (at the sample mount) for cost reasons. The liquid helium is contained in a reservoir similar to a copper cup over the sample mount. As the helium boils and evaporates only the latent heat of vaporization is used to cool the sample mount. There is no provision to capture the enthalpy of the gas as it escapes from the cryostat at 4.2 K regardless of the sample temperature. The cooling power of the gas is wasted. Enthalpy of helium gas from 4.2 to 300 K is substantial at 1542 J/g. 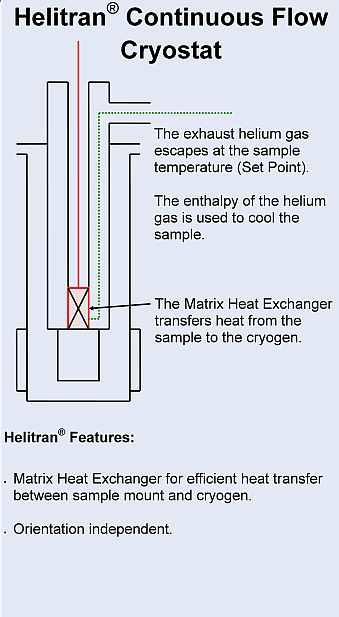 The Helitran® incorporates an extended surface heat exchanger (matrix heat exchanger) at the cold tip which provides efficient heat transfer between the helium and the sample mount. The liquid helium flows through this heat exchanger and as the latent heat of vaporization cools the sample mount, the liquid evaporates. The gas continues to flow through the heat exchanger, providing additional cooling (capturing the enthalpy of the gas) to the sample mount. If the flow is optimized, the helium gas will exit the matrix heat exchanger at a temperature equal to the sample temperature. Amount of Cryogenic fluid required to cool metals to 4.2K. From this data, it is clear that without an extended surface cryostat tip heat exchanger, the consumption of helium during initial cooldown is 40 times higher from 300 K (room temperature) to 4.2 K, and 14 times higher when cooling from 77 to 4.2 K, regardless of sample size. Sub 4.2 K Operation: The temperature of helium drops to 1.8 K when the pressure is reduced across an adjustable impedance valve. Pumping on a reservoir, as in a traditional system, is not practical as all the helium will evaporate rather quickly. In the Helitran® a pressure differential is applied against the impedance valve by attaching a vacuum pump.This reduces the pressure of the helium as it flows through the matrix heat exchanger. The matrix heat exchanger and the conductively coupled sample mount are cooled to below 1.8 K.
800 K Operation: High temperatures can be achieved by incorporating a thermal switch composed of sapphire and OFHC copper. This utilizes the unique property of sapphire, whose thermal conductivity is roughly equal to that of copper from 4-300 K but becomes a thermal insulator at temperatures above 300 K. The high cooling power of the matrix heat exchanger protects the cold finger from damage. Conventional helium flow cryostats utilize a transferline with a superinsulated capillary suspended inside a vacuum jacket. However, as the capillary absorbs the 300 K thermal radiation from the vacuum jacket, the liquid helium is vaporized, forming gas bubbles. These gas bubbles expand, forming a temporary block to the flow of the liquid called “vapor binding.” The result is a liquid/gas mixture which is delivered to the cold tip in spurts, causing vibrations as well as pressure and temperature cycling. The coaxial flow transfer line diverts a small portion of the liquid helium flow to create a shield flow surrounding the cryostat supply capillary for the entire length of the transfer line. A pressure differential is created by a nozzle at the entrance to the coaxial shield flow tube, resulting in a corresponding temperature drop inside the shield which subcools the cryostat supply capillary. This subcooling prevents boiling and gas bubble formation inside the cryostat supply capillary, even at very low flow rates. The helium is delivered to the cryostat with the desired temperature stability and low vibrations. All welded stainless steel without any epoxy joints for a clean sample environment. The vacuum shroud can be customized for optical or non-optical experiments. 4.2 K to 500 K. This is easily attained with no special provisions or modification. 1.7 K-500 K can be achieved due to the combination of the impedance valve and a vacuum pump installed on the helium exhaust. The lower pressure across the valve results in a lower temperature at the sample. 4.2 K-800 K can be achieved with a thermal switch to protect the cryostat during the high temperature operation. Matrix Heat Exchanger for minimum consumption of helium. Co-axial Transfer Line for reduced flow of single phase helium. Applications for the LT3 are primarily in optical and non-optical experiments; spectroscopy, PL, transport, and thermal properties. Matrix Heat Exchanger integrated with sample mount for minimum consumption of helium. Scanning Tunneling Microscope: The Helitran® is uniquely designed for the STM application. With the coaxial flow transfer line and the matrix heat exchanger combination, the vibrations at the STM are less than 1Å. Scientists have used the Helitran to cool STM samples to less than 8 K with drift less than 0.001 Å per minute. Matrix Heat Exchanger integrated with sample mount. This is especially useful because of the typical larger size and varying orientations of the sample holders used with the LT3M. Surface Science/UHV Manipulators: The Helitran® is uniquely designed for the UHV manipulator. With the matrix heat exchanger the helium consumption is dramatically reduced.